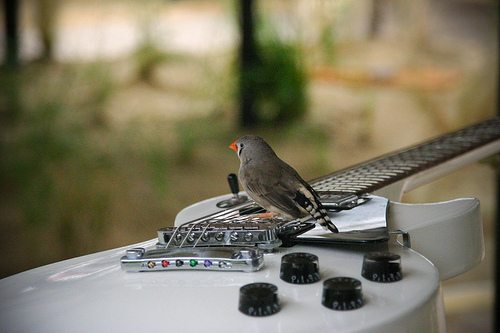 Commissioned by the Barbican Curve gallery, Boursier-Mougenot composed a installation with 40 Zebra Finches and a range of electric Les-Paul guitars. Trained as a classical composer the artist has been staging sound installations since the early 90's based on the rhythms of daily life. As the birds fly and feed from their electric perches they create a live soundscape, interactive with its audience.